Levittown, New York, USA. June 4, 2018. 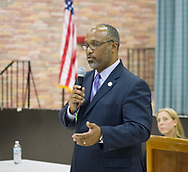 DuWayne Gregory and Liuba Grechen Shirley Debate, for Congressional District 2 Democratic primary. Debate held by Seaford Wantagh Democratic Club at Levittown Hall.